I have abandoned this project. In less than six inches of weaving I've already had five warp ends break. That's going on one repair per inch! With an intended project length of about 48 inches (times two), that is not acceptable. This was to be a Pine Tree Table Runner in summer & winter. I adapted the draft from Carol Strickler's A Weaver's Book of 8-Shaft Patterns (#549 page 155). I bought the warp as a mill end, about 7 or 8 years ago at Holly Bee in Valdese, North Carolina (back in the days when they had a shop and sold weaving yarns). It's an 8/2 unmercerized cotton, and I think I paid only a dollar or two for it. It would be okay weft, but it is too weak to be warp. And there's only so much frustration a body can endure. Grrrr, how annoying! Are you going to try the design again with a different warp or is it now tainted by association? The worst warp I had was one that was so overspun I couldn't even get it on the loom. I battled with it for far too long and would have done much better to cut my losses and begin again - which eventually I was forced to do. I wonder if sizing of some sort would help? Worth a try. It is pretty! What a shame. Do you have any newer 8/2 that matches? What you have done is so lovely. I have a collection of cottons I bought as mill ends that are too weak for warps. It is frustrating. I wasn't familiar with weaving cottons when I bought them. I'm sure this is especially frustrating when you had such an interesting project. Before you abandon it, have you tried painting a size on the warp? Creating beautiful things is not intended to be a flogging session for the creator. I believe abandoning ship was the best course of action for your sanity. I hope you try the weave again with something else. It was looking lovely. What a shame Leigh! But I totally agree with you: life is too short to get annoyed by some yarn! Keep the rest for weft and throw the warp out. Glad to see you still like the summer and winter! Thanks for sharing your dilemma. After weaving a couple of years you'll find the same thing has happened to all of us. Is it because the yarn was old? I honestly don't know if that can be a problem or not. Naturally, since it's got the same pattern components as my coverlet, I really really really! wanted to see your S&W version -- but alas. Maybe another day. Weave on -- and good on ye for "cutting your losses." Oh, that's sad. It's a sample anyway. You can file it away under "dud warp yarn, nice pattern." Woulda, coulda - so smart to know when to say when. When it's not fun anymore is a good time to say when. Hope to see this again in the future with different yarn. Bspinner, I hadn't thought about that. The age of the yarn could definitely be a problem. I hadn't thought about sizing; I should have talked to you all before I cut it off. But on the other hand, I do have more (different) 8/2 cotton in navy, so I will try one of those and tie on for another go at this pattern. As Jane mentioned, it is a neat draft. Hi there Leigh! I have to say, I'm pretty ruthless about cutting off troublesome warps as well... 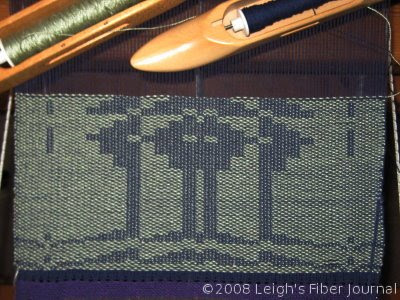 When I started weaving I just didn't have a lot of time, so, off it would come, but it gave me a lot of practice warping! Now I tend to try to fix things more, but if I have that many warp ends break, off it would come, too. :) Lovely pattern, though, I'm glad you're trying again with different yarn!